This is possibly the easiest homemade gift ever! but my brother (who works at a monogram store) says that they are super-popular with the sorority girls. 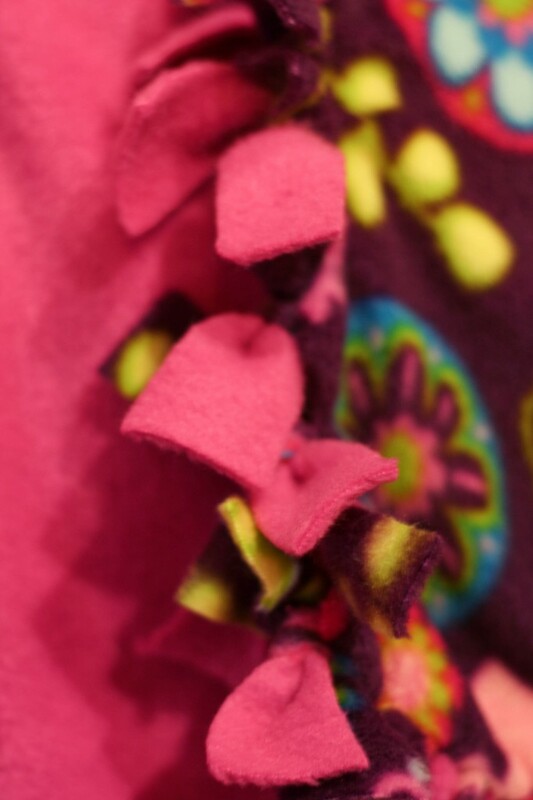 There are a lot of ways you can do a fleece tie-knot blanket. You can use a single piece of fabric and tie just the top and the bottom. You can use a single piece of fabric and knot all sides. (similar to this one-which we bought, but hated the cheap-o fabric). You can even add a back to that, if you want. Or you can use 2 pieces of high-quality fleece like I’ll be showing here. Fleece is almost always on sale these days, and I actually found nice, thick fleece at Hancock’s for $4/yard! The blanket that you see here is a 36″x58″ blanket, which is the size I typically do for toddlers. For babies, I usually do anywhere from 36″x36″ to 40″x40″ because I like them to be square. But you can really do any size you want. So what do you need and how to do you make it? All you need is 2 yards each of 2 coordinating fabrics and a pair of scissors! STEP ONE: Lay out your fabric and measure how big you’d like it to be. 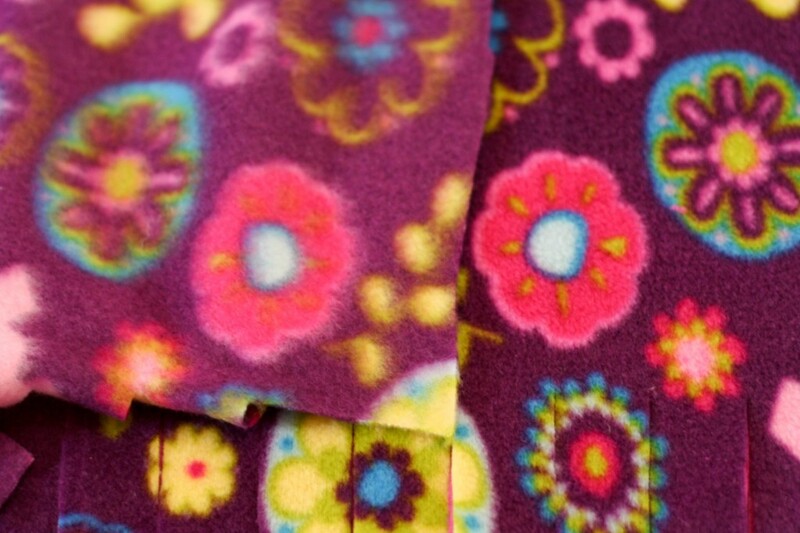 For a typical baby blanket, I do either 36″x36″ or 40″x40″. 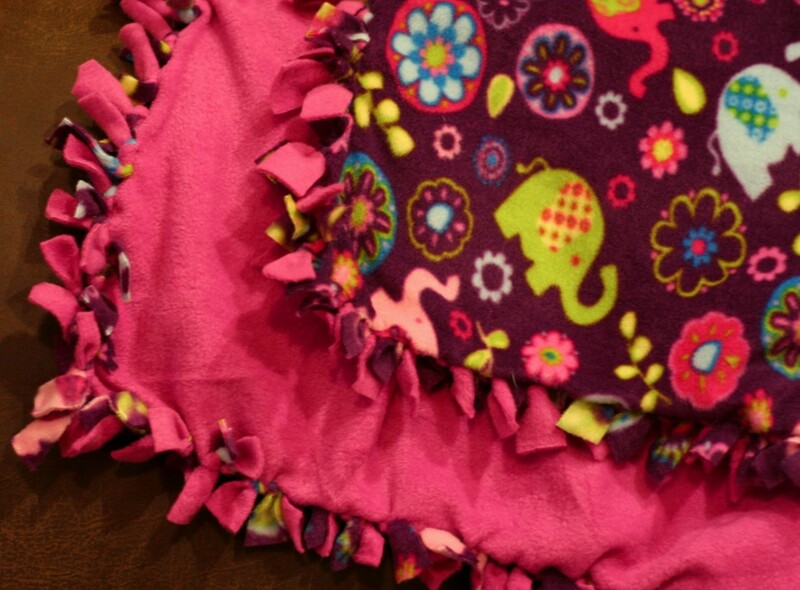 Because I am making this for a “big sister” I wanted it a little bigger than the blankets the babies would get. 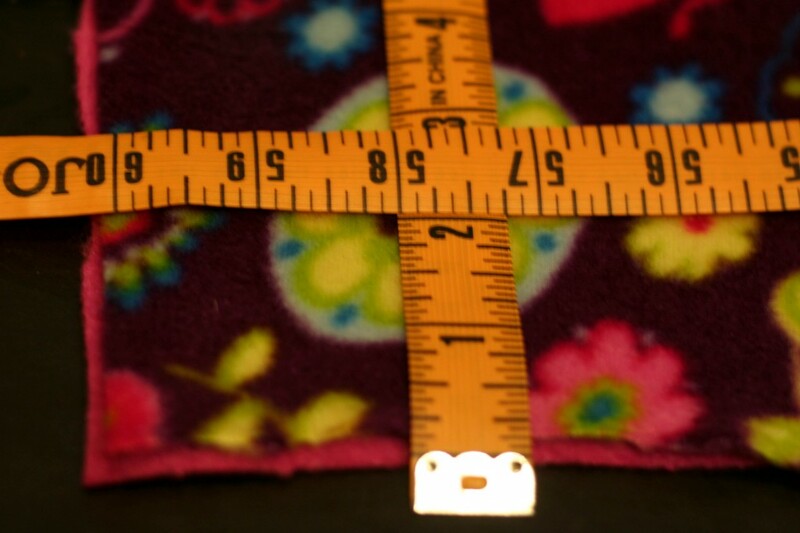 The length here is about 58″ and I measured the height up to about 36″. 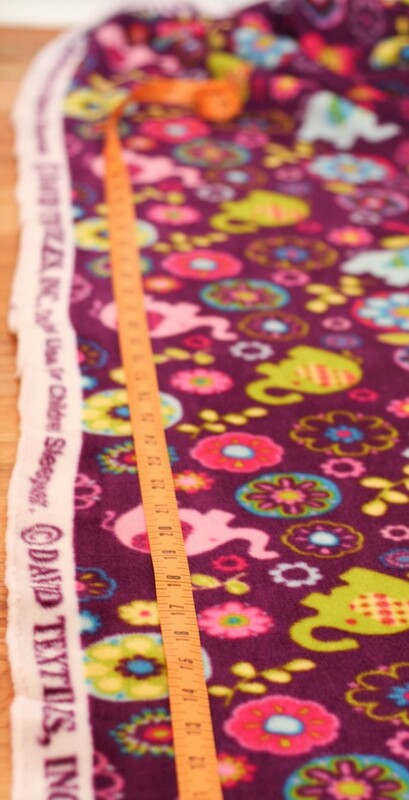 (For an average throw-size blanket, what I usually do is lay out my fabric and cut off the selveges. STEP TWO: Trim off the selvage(like the white part shown here) on two edges of the fabric. STEP THREE: Put the wrong sides together. so that when you tie it together the “good” sides are out. I used the first piece of fabric I cut as a template to cut out the second piece. STEP FIVE: Cut out a 2″ square from each corner. 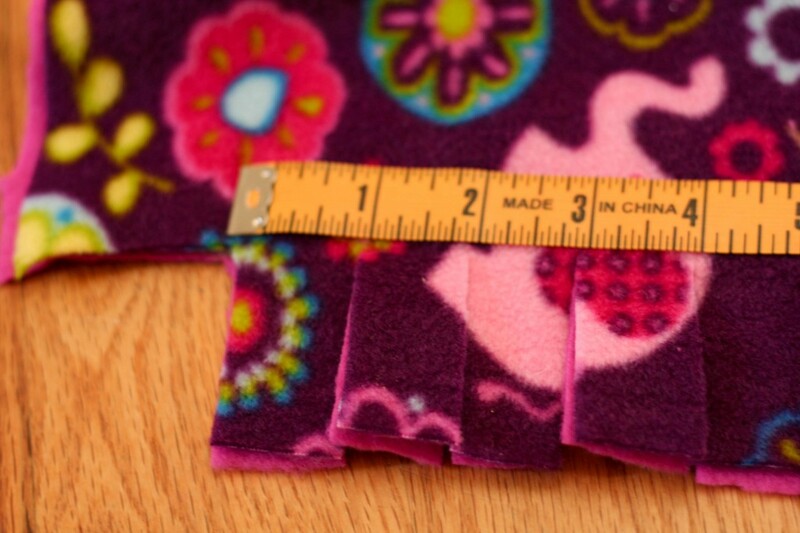 STEP SIX: Going from one end to the other, cut through both pieces of fabric about 2″ high in 1″ intervals. STEP SEVEN: Now tie ’em up. OOOooooo that’s awesome! Adding one more to the list of ideas for me!